As a result, money for research has dried up, and any number of promising avenues that might have moved the issue forward remains unexplored. How did this happen? The answer has a lot to do with junk science, but not the kind often associated with EMFs. No one would deny that the EMF literature is studded with poor studies —those that claim to show effects that can't be repeated. This happens with EMFs, as well as all other types of research. In this case, we are referring to industry's own brand of junk science that promotes misinformation and confusion and presents a distorted picture of EMF science. The story that follows illustrates how electric utilities play the junk science game. It shows how two of its long-time operatives are corrupting the EMF literature. Leeka Kheifets and John Swanson, together with two utility associates, are calling for an end to research on the links between power-line electric fields and cancer. In a paper that will appear in the February 2010 issue of Bioelectromagnetics, Kheifets and Swanson argue that studies on electric fields and cancer have come to a dead end and that its time to close the book on them. There is "little basis for continued research," they claim. In fact, it is just the opposite. Epidemiologic studies on electric field effects on workers have produced some of the most provocative findings in the entire EMF cancer literature. This work has been ignored for years and now Kheifets and Swanson want to bury it for good. Kheifets and Swanson are industry scientists. Kheifets spent the bulk of her professional career at EPRI, the electric utility research group, and now serves as a freelance consultant. Swanson works for National Grid, a huge electricity delivery company that operates in the U.K. and the U.S. Their new paper was bought and paid for by Energy Networks Association (ENA), a U.K. power-line trade group. On its Web site, the ENA states, "The overall case that power-frequency electric fields are causally linked to human cancer … can reasonably be called non-existent." To support the ENA position, Kheifets and Swanson offer a review of the electric field literature that is astonishingly brief. All the laboratory and animal studies are covered in a single paragraph that runs little more than 100 words. The heart of their new paper is about the epidemiology: studies of people who have been exposed to electric fields at home and at work. The residential studies, they concede, don't tell us very much. Their entire argument to stop research boils down to just one set of studies —those of workers exposed to electric fields on the job. There are only six of them. Much of the concern over EMFs began in the early 1970s when reports came out of the Soviet Union that workers in electrical substations were suffering from numerous health problems, everything from heart palpitations and sexual dysfunction to general irritability and loss of appetite. The Soviets blamed electric fields and most of the follow-up studies —here and there— focused on those types of EMFs. That all changed in 1986 when David Savitz repeated Nancy Wertheimer and Ed Leeper's landmark study linking childhood leukemia to magnetic fields. Almost overnight, electric fields were written off as everyone's attention shifted to magnetic fields. This went on for the next ten years, and then in 1996, Tony Miller of the University of Toronto brought electric fields back into play, if only very briefly. In a major epidemiological study of electric utility workers, Miller found that when he took into account exposures to both electric and magnetic fields, he saw a much higher risk of developing leukemia than when he looked at magnetic fields alone: He reported increases that were up to 11 times the expected rate. "This study suggests that electric fields are potentially critical to cancer risk," Miller told Microwave News at the time (see MWN, J/A96, p.1). Miller's study was part of a joint Canadian and French project. Later that year, the leaders of the French team, Marcel Goldberg and Pascal Guénel of the National Institute of Health and Medical Research (INSERM) in Paris, reported that, while they did not see a leukemia risk, they did find an up to sevenfold increase in brain cancer among those exposed to electric-fields for 25 years or more. This association, they said, was "remarkable" (MWN, J/F97, p.4). Miller's findings caused a stir when they were published. "It's alarming," the head of the Power Workers' Union told a Canadian newspaper. He called "for immediate employer and government action to protect workers." Ruth Greey of Ontario Hydro, the local electric utility whose employers had been surveyed by Miller, tried to calm everyone down by promising more research on electric fields, and urging patience until Miller's results could be confirmed. "We would be irresponsible at this point to change anything or alarm anyone until the study is replicated," she said. EPRI issued its own statement stating, "further studies are needed." Ontario Hydro never did a replication study. Neither did EPRI. Instead, Kheifets, then an EPRI project officer, embarked on a much cheaper —and meaningless— effort to take the heat off electric fields. Her plan involved resurrecting some old data to discredit Miller's findings. A few years earlier, Kheifets had managed an epidemiological study of leukemia among electrical workers under the direction of John Peters and Stephanie London at the University of Southern California (USC) in Los Angeles. Because it was an EPRI project, she had free access to the USC study files. Kheifets had to overcome a major problem: The USC researchers had done a magnetic field not an electric field study. They had relatively few electric-field measurements —for only about a quarter of their study population. They did not have a single measurement for power line workers, the group with the highest exposures. All in all, Kheifets had electric field information for just six utility employees. In contrast, Miller's team had sampled electric and magnetic field levels for 260 unique job titles at 140 different electric utility sites. Kheifets moved forward regardless. She published a three-and-a-half-page paper in 1997, claiming that there is "little support for an association between occupational electric field exposure and leukemia." There could be no doubt that this paper was her brainchild. She herself was the lead author —not Peters or London, the principal investigators on the original project. The USC magnetic field paper, published three years earlier, ran 16 pages and had eight authors; Kheifets was not among them. The Kheifets-USC study was industry's last word on electric fields —that is, until this summer when she and Swanson called for research to stop. The Canadians, on the other hand, carried on. Paul Villeneuve, a graduate student working on his doctoral thesis at the University of Ottawa, took a second look at Miller's data. He found that workers exposed to high electric fields for many years suffered what he called "dramatic increases in leukemia." Writing in the June 2000 issue of the American Journal of Industrial Medicine, Villeneuve reported that those who had worked for Ontario Hydro for at least 20 years in electric fields that were often above 10-20 V/m had up to ten times more leukemia. In a second paper published at about the same time in Occupational and Environmental Medicine, he noted elevated risks of non-Hodgkin's lymphoma among the same group of workers exposed to high electric fields. Villeneuve's papers are significant for two reasons. First, they emphasized once again the urgency of investigating electric fields, not just magnetic fields, as Miller had recommended four years earlier. David Savitz, then chairman of the department of epidemiology at the University of North Carolina School of Public Health, told Microwave News at the time that Villeneuve's results prompt the need to take a fresh look at electric fields (see MWN, M/J00, p.1). Second, Villeneuve showed how new measures of classifying exposure could clarify cancer risks. Up to that time, epidemiologists had rarely looked beyond simple average field levels. Many had seen elevated cancer rates, but the increases were generally not that big. Now by separating out those workers whose exposures exceeded certain thresholds for many years, much higher risks emerged. Villeneuve's hypothesis makes intuitive sense: Those exposed to higher doses would be at greater risk. In retrospect, it seems all too obvious, but no one had yet tested the idea. (A short time later, De-Kun Li at Kaiser Permanente in California, using a related exposure index for magnetic fields, saw a link to miscarriages among women exposed above a certain threshold (16 mG), see MWN, M/J01, p.1. After Villeneuve, no one would again investigate thresholds in an EMF-cancer study. Of the six occupational studies reviewed by Kheifets and Swanson, four came from the same Canadian-French project of electric utility workers. All four point to unprecedented increases in leukemia, lymphoma and/or brain cancer. The fifth is an epidemiological study of Norwegian railroad workers. Its relevance is questionable. Norwegian railways operate at 16⅔ Hz, while U.S. and European electrical systems operate at 60 Hz and 50 Hz respectively. Kheifets and Swanson neglect to mention this inconvenient fact. Another important omission: The Norwegians did not actually measure worker exposures to electric fields. Writing in the American Journal of Epidemiology in 1994, Tore Tynes's team cautioned that their estimates of electric field exposures were not reliable. The sixth and last paper was Kheifets's own analysis of the meager USC electric field data. Joe Bowman, an industrial hygienist now at NIOSH in Cincinnati, was responsible for the USC measurements. When recently asked to compare the USC study to Miller's, he replied: "The study designs are not in the same league; Miller's is far superior. To claim that Miller's findings were not replicated on the basis of my data is ridiculous." Bowman explained that it is "very difficult" to measure electric-field exposures, because the very presence of the workers can distort the ambient fields. Kheifets and Swanson acknowledge this problem but use it selectively to try to discredit the meter —the Positron— used in the Canadian-French project. "[A]n association reported in these but not other studies is highly unlikely due to more accurate measure of exposure," Kheifets and Swanson write. Given that there was a total of only six measurements of electrical utility workers in those "other studies" —those by Tynes and Kheifets herself— their argument is, to be blunt, absurd. The Positron meter was designed by Paul Héroux when he was working for IREQ, the research arm of Hydro-Québec, in the 1980s. Héroux, who is now at McGill University's medical school, rejects Kheifets-Swanson's criticism. "Exposures based on Positron electric field measurements are more precise, even when perturbed by the body, than those based on unperturbed spot measurements," he told Microwave News this fall. "There is inevitable inaccuracy in any form of exposure assessment, but dosimeters provide the best estimates." Bowman agrees. "In reality, the Positron studies are the best ever electric field studies of utility workers," he said. Héroux reserves his most damning criticism for Kheifets and Swanson's abuse of their positions as technical experts. "They are providing a twisted view of measurement methods in a way can only be interpreted as favoring a political agenda," he said. "It would appear that they want to belittle scientific data that their employers find embarrassing." Bowman, Héroux, Miller and Villeneuve all say that research on electric fields should have continued. Miller, who retired in 1996, is back at the University of Toronto, where, as the associate director for research at its School of Public Health he hopes to stimulate increased collaborative research on environmental issues, including EMFs. "I am disappointed that other people did not follow through and repeat my study," he said in a recent interview. "It needs to be pursued. It definitely needs to be pursued." Villeneuve, who now works for Health Canada in Ottawa, strongly agrees. "The magnitude of the risk and the accompanying dose-response we found are very provocative," he told Microwave News not long ago. "Further research should be done." There is nothing surprising about researchers wanting others to follow in their footsteps, but to hear such unanimous and passionate calls for replication so many years later is remarkable. The Miller-Villeneuve studies are arguably the most important in the EMF occupational literature. They have long demanded more serious attention and might not have been ignored if members of the EMF community —indeed, anyone— had spoken out for public health. In the mid-1990's, when she was at EPRI, Kheifets was one of the few people in America who was in a position to fund a replication effort. Instead, she published a junk paper and dressed it up as a refutation. Now she and Swanson are trying to use that same paper to finish the job. Actually, Kheifets and Swanson's paper is worse than junk science, it's fraud. The paper seeks to give the electric industry a major prize by taking electric fields off the EMF health agenda. This is, by any reasonable definition, scientific misconduct, and is far more serious than any of the cases that have been pursued by those who police scientific integrity (see "Three Cases of Alleged Scientific Misconduct"). Far from ever being challenged, Kheifets has been and continues to be in great demand. She has helped shape every major EMF risk evaluation in recent memory. Swanson has been invited to attend many of the same meetings. ICNIRP, which touts itself as being free of industry ties, has had Kheifets on its Standing Committee on Epidemiology for the last seven years. The committee publishes influential literature reviews on health risks, including the possible links between power lines and cancer. Back in 2001, IARC, the International Agency for Research on Cancer, though fully aware that Kheifets worked for EPRI, invited her to sit on its committee evaluating EMF cancer risks as a full voting member. IARC also welcomed Swanson to sit in as an observer. According to those who were at the meeting, Swanson participated in the deliberations no differently that he would have as a member of the committee. Soon afterwards Kheifets joined Mike Repacholi at WHO's EMF Project in Geneva. EPRI continued to support her while she was at the WHO, even though this was in apparent violation of WHO rules governing conflicts of interest (see our August 9, 2005 post). One of Kheifets's responsibilities at WHO was helping Repacholi write and coordinate what would become the organization's official position on power-line health risks, a document known as the Environmental Health Criteria. In the fall of 2005, Kheifets and Repacholi invited eight observers to attend a meeting where the final conclusions would be hammered out. All eight had close ties to the electric utility industry (see "WHO Welcomes Electric Utility Industry To Key EMF Meeting,"). Thériault's study was the first to link transients to cancer and, like the project's studies on electric fields, threatened to open a new front in EMF research. Hydro-Québec moved quickly to block it. With Plante's help, the utility forced McGill to return the all the information he had collected on the utility workers and their EMF exposures. Thériault was never allowed to see the data again. None of the papers from the Canadian-French project that implicate electric fields or transients —those by Miller, Villeneuve, Goldberg-Guénel and Thériault— are cited in WHO's EMF Environmental Health Criteria document. It is as if those studies never happened. Mike Repacholi, the former head of both ICNIRP and the WHO EMF Project, likes to reassure his critics that he has always been guided by the science and only the science. "Throughout my time at the WHO I can say unreservedly that all decisions were based on the science by committees of experts," he said in an interview not long after his retirement. Paolo Vecchia, the current chair of ICNIRP, professes to be similarly moved. "Restrictions [on EMF exposures] are based on science: Only established effects are considered," he told a London conference organized by the U.K. Radiation Research Trust last year. The history of electric field epidemiology shows how easy the science can be manipulated. Important studies are paid lip service, and then never repeated. Sometime later, they are buried away. Effects can never be established and acted upon if they are ignored and misrepresented. Those that are successfully repeated are endlessly questioned. The childhood leukemia link has been forever marginalized. There is no mechanism and because we can't explain it, it can't be true, so goes Repacholi's, Vecchia's, Kheifets's and Swanson's argument. What gets lost is that if EMFs can bring on childhood leukemia, it may lead to other types of cancer too, perhaps by some other mechanism. If it's not impossible for childhood leukemia, other nasty things may follow too. All this hypocrisy is not lost on those who are left outside looking in. Discontent and contempt are widespread. This led to the founding of ICEMS to promote research and assess health risks. ICEMS is designed to serve as a counterweight to the WHO and ICNIRP. A number of its members put together the BioInitiative Report, an alternative interpretation, of the EMF health literature. 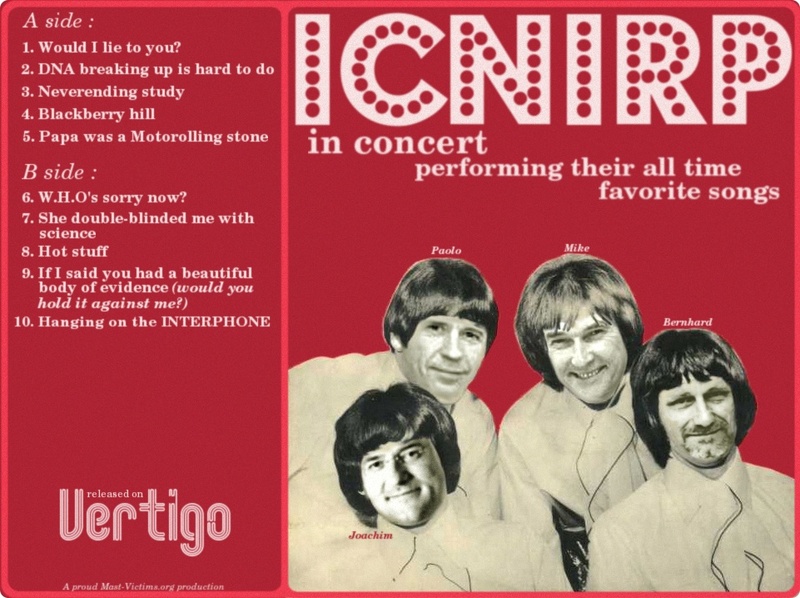 On a lighter note, last summer, activists translated their frustrations into satire: They circulated a promo for "ICNIRP in Concert," a mock CD. "Would I Lie to You?" was among the promised songs. It was a huge hit on the EMF circuit. Distorting the public health literature is not a victimless crime. Workers who will be exposed to higher EMFs will have, according to Miller and Villeneuve, a tenfold greater cancer risk than if precautions were to be taken. Kheifets and Swanson's fraud is no different from that which helped suppress the cancer risks of cigarette smoke, asbestos and many, many chemicals. Yet these industry scientists continue to be welcomed at the highest levels as fair and balanced experts. Why doesn't anyone speak out against the corruption in their midst? Over the last few years, Germany's Alex Lerchl has made a career out of demanding that Hugo Rüdiger be punished for scientific misconduct, which has never been substantiated (see “Three Cases of Alleged Scientific Misconduct”). When we asked Lerchl about his motives some time ago, he replied, "I don't like rubbish being published." On that we can agree. But why then isn't he —or anyone else— up in arms against Kheifets and Swanson's electric field rubbish? Why are industry scientists never held to account for their actions, even as they pursue others whose crimes are petty in comparison? Perhaps because the work of those other scientists challenges industry's interests. The playing field is far from fair. It's time for industry scientists to be held to the same standards and suffer the same penalties as they would apply to others. At the very least, those who deceive through scientific misconduct should no longer be able to receive government research grants or sit on advisory and peer review panels. EMFs will never be taken seriously as long as no one is willing to acknowledge the real junk science in our midst. Louis Slesin, the editor of Microwave News, has published a “Comment” on the Kheifets-Swanson call to stop electric field research. It appears in the same February 2010 issue of Bioelectromagnetics as their paper. Kheifets and Swanson declined to respond to Slesin's charge that their paper was "little more than industry disinformation."